Get what you really want this Easter and enjoy up to 35% off your stay at Crowne Plaza Queenstown. Regardless of the season, Queenstown has been always been known as the adventure capital of the world - be it outdoor sports or indoor activities, you'll never run out of things to do. And what better way to experience them all by being in close proximity to them. Welcome to Crowne Plaza Queenstown where you will not only find yourself enjoying the stunning scenery from our hotel but also experiencing the pleasure of travelling by being in the heart of town. If you are looking for the perfect hotel accommodation in Queenstown central area, look no further than Crowne Plaza Queenstown. With snap-worthy views in every direction, the only thing you will have to worry about is storage space on your camera. There is one thing our guests rave about, it's our central location. Perched on the shores of Lake Wakatipu with sweeping views over The Remarkables Mountain Range, Crowne Plaza Queenstown hotel is just seconds from Queenstown's main streets. If atmosphere, great food and amazing views are high on your priorities list, we have you covered. Steamer Wharf, Queenstown's eating, drinking and entertainment destination, it's just around the corner. Minutes from Queenstown's town center, it's a very short walk to the waterfront boardwalk and to the main shops area. Wondering what's behind our doors? Crowne Plaza Queenstown hotel consists of 139 hotel rooms from Courtyard View Rooms, Mountain View Rooms, Balcony and Lake View Rooms to our incredible Deluxe Suite. Queenstown draws skiers from all around the world due to its incredible vistas, and long ski season. Most years you can ski right into the beginning of New Zealand's spring (September). At Crowne Plaza Queenstown hotel we are well known as one of the top Queenstown ski hotels with complimentary heated storage for your snow gear. Crowne Plaza Queenstown hotel is also part of the InterContinental Hotels Group. Join IHG® Rewards and earn points when you stay at over 5,000 hotels worldwide. Your points go towards great discounts, free hotel nights, air points and more. Sign up today, it's simple and free. Members also get an additional exclusive discount when they book direct, so it's well worth signing up. If you are looking for places to stay in Queenstown, look no further than Crowne Plaza Queenstown hotel. With snap worthy views in every direction, the only thing you will have to worry about is storage space on your camera. If there is one thing our guests rave about, it's our central location. 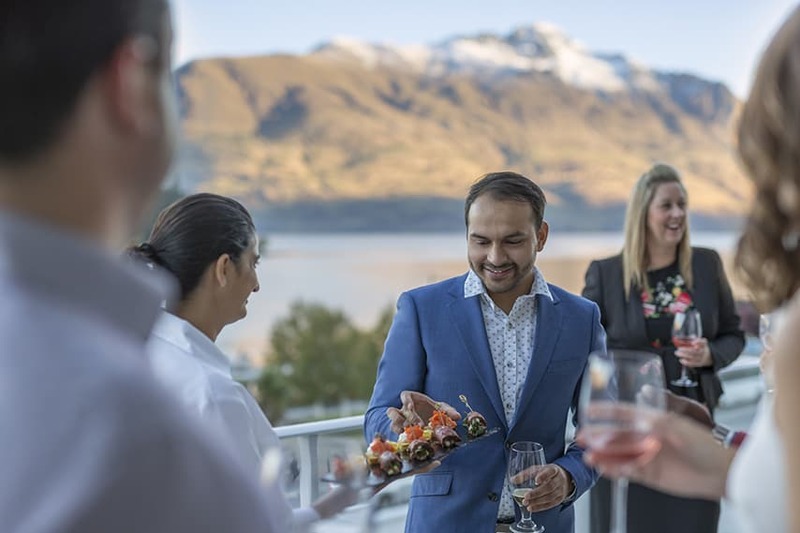 Perched on the shores of Lake Wakatipu with sweeping views over The Remarkables Mountain Range, Crowne Plaza Queenstown hotel is just seconds from Queenstown's main streets. If atmosphere, great food and amazing views are high on your priorities list, we have you covered. Steamer Wharf is across the road, famous for its great bars and dinning with live music. Minutes from Queenstown's town center, it's a very short walk to the waterfront boardwalk and to the main shops. Located just seconds from Queenstown's main streets with unique views of Lake Wakatipu and The Remarkables. Unlimited WiFi is available throughout the hotel to be connected across different devices. Being well-rested is essential that's why we provide aromatherapy kits, premium bedding and quiet zones. If you want to know what to do in Queenstown, just visit our Concierge team, they are here to help you. Our Sleep Advantage™ Program will help you get the shut-eye you deserve with dedicated quiet zones, premium bedding, aromatherapy sprays and guaranteed wake up calls – exclusive to Crowne Plaza's worldwide. Looking for Queenstown meeting, conference or event venues? Crowne Plaza Queenstown hotel plays host to some incredible conferences and events - after all, inspiring ideas need inspiring spaces. With three flexible hotel meeting venues, our great team knows how to host your next big corporate event, conferences, meetings or custom-made events. Talk to our Events and Meetings Director today, they know what they are doing and can plan and facilitate the perfect event, according to your specs. With 3 flexible meetings and conference venues, inspiring meeting packages and a dedicated meetings team, we will cover every detail for your next event. Become a member and stay at any of our 5,200+ hotels around the world.